Although I’ve seen many birds over the years, it’s not often that I’m introduced on a first-name basis with one. So, I’m happy to report that I’ve now made the acquaintance of Rufous, a resident of the woodlands around Flag Pond, a small community in Unicoi County, Tennessee. Photo by Bryan Stevens Rufous the ruffed grouse has been visiting the farm of Leon and Janice Rhodes for the past couple of years, apparently showing little fear of his human neighbors. Rufous is a ruffed grouse that has been a fascinating and funny neighbor to Leon and Janice Rhodes for the past couple of years. I met Rufous on Saturday, June 25, at the Rhodes family farm. Brayden Paulk, a grandson of the couple, invited me to visit and attempt to meet Rufous. This particular grouse is apparently a creature of habit, and Brayden suggested that a morning visit might be more conducive to my chances of getting to know Rufous. I arrived around 9 a.m. and met Brayden and his grandfather. We went to a nearby barn, which apparently serves as a familiar meeting spot for Rufous and those people lucky enough to have gotten to know him over the past couple of years. 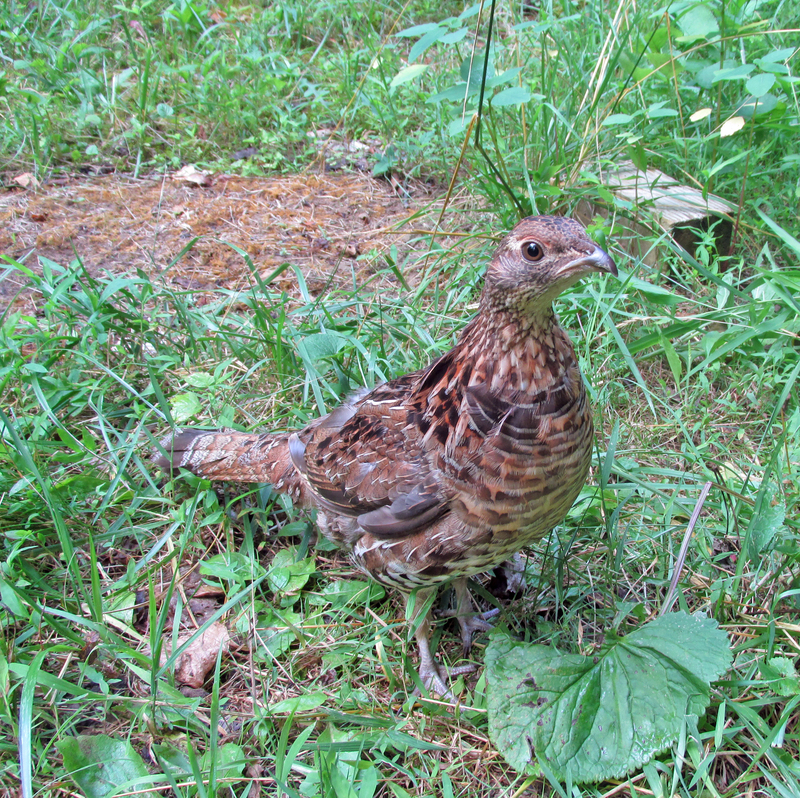 Rufous is only one member of a family of ruffed grouse in residence on the Rhodes property. 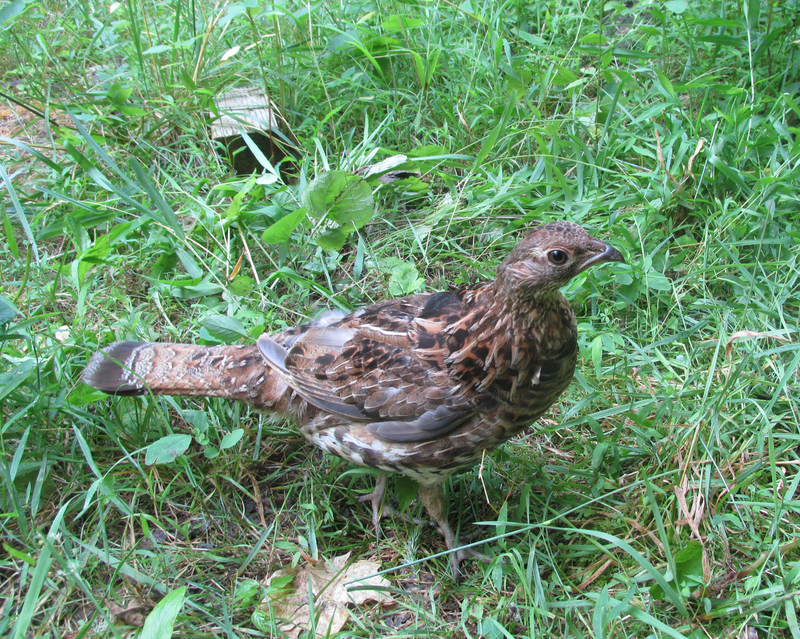 In an email to me, Brayden told me that the mountain farm is a good place to see ruffed grouse. The 17-year-old doesn’t live in Tennessee, but he is a frequent visitor, spending time with his grandparents as often as possible. He and his family live in Oxford, Alabama. He also told me that his grandparents send him every one of my bird columns in the mail. Photo by Bryan Stevens Inside his grandfather’s barn, Brayden Paulk spends a moment with Rufous, a ruffed grouse with an abundance of charisma. “I do happen to live in a great place for birds,” he informed me in an email. His home is located close to the Mountain Longleaf National Wildlife Refuge, which Brayden said is known for breeding blue-headed vireos, red-headed woodpeckers, and Swainson’s warblers. “It has a lot of longleaf [pine] habitat, so I hope soon that red-cockaded woodpeckers might be reintroduced there, and establish a colony,” he added. The red-cockaded woodpecker is classified as an endangered species across much of the southeastern United States. Brayden is a volunteer working in the Talladega National Forest in the foothills of the Appalachians on a study focused on the effects of controlled burns on cavity-nesting birds, such as red-cockaded woodpeckers. He is an enthusiastic and, as I learned after meeting him, quite an accomplished birder. Warblers are his favorite family of birds, followed by ducks and sparrows. “I enjoy where I live because I get to enjoy species such as the black-throated green warbler, blue-headed vireo and even red crossbill in the summer,” he said. We have also exchanged emails in a discussion about why some of these birds, which are usually found in the boreal forests much farther north, stay much farther south along the spine of the Southern Appalachians. His future plans are to major in Conservation Biology. “I hope to get a masters in ornithology from Cornell,” Brayden shared. Photo by Bryan Stevens Leon Rhodes uses his cap to challenge Rufous to a friendly duel. Of course, during our recent meeting, his focus was on arranging a meeting with Rufous, a bird with “a lot of personality.” Both Brayden and his grandfather cautioned that Rufous doesn’t follow a schedule. In other words, the meeting would take place only if Rufous was so inclined. Although he has a very tame nature, Rufous is most definitely a wild bird. Fortunately, I didn’t have to wait too long. 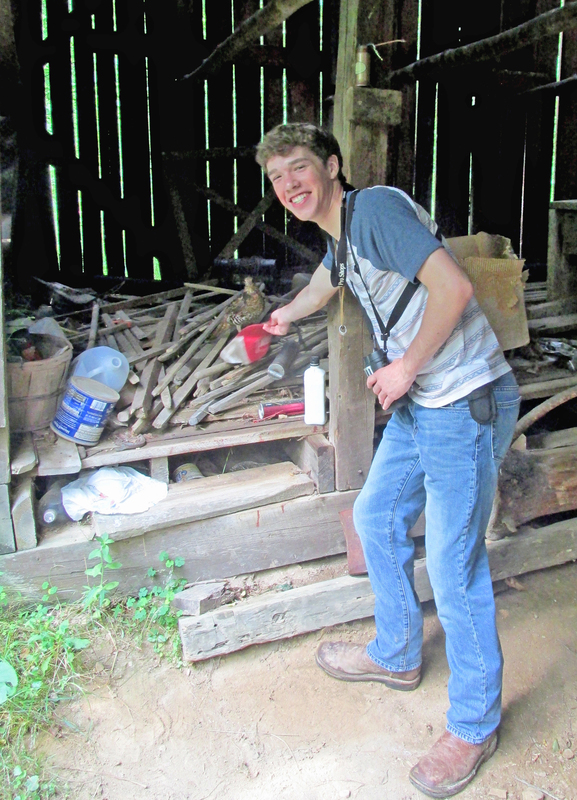 Brayden was the first to detect the soft clucks as Rufous made his way cautiously toward the old barn. He emerged from the surrounding woodlands and walked into the barn where I was seated and waiting with Brayden and his grandfather. Rufous immediately noticed my presence, identifying me as a stranger in the midst of some more familiar friends. He kept a wary eye turned on me during his visit. After a few moments of watching Rufous strut around the barn like he owned it — and perhaps he does in his own mind — I removed my camera from my pocket. I made sure that my actions didn’t alarm Rufous. When he didn’t object, I proceeded to take photos and videos of this very personable ruffed grouse. Photo by Bryan Stevens Rufous would have started out life much like this ruffed grouse chick, which was photographed on Holston Mountain in Carter County, Tennessee. One of his favorite activities during these visits is to duel with a red baseball cap worn by Leon Rhodes. Whenever Brayden’s grandfather removed the cap and waved it in front of Rufous, the grouse became very focused. He channeled his attention almost exclusively on the cap until, with a startlingly swift attack. The entire sequence reminded me of a bull attacking a matador’s red cape. For probably a half hour, Rufous put on quite a show, and I think Brayden and his grandfather were thrilled that the grouse proved so cooperative during my visit. Early American naturalist and painter John James Audubon painted these ruffed grouse as a familym unit. After my visit with Rufous, I took Brayden for a brief birding trip to Rock Creek Recreation Area near Erwin, Tennessee. I was hopeful we might get to see a black-throated blue warbler, which has been an elusive warbler for Brayden. We did get some good birds at Rock Creek, including hooded warbler, Northern parula, blue-headed vireo, red-eyed vireo, black-throated green warbler and blue-gray gnatcatcher. We didn’t, however, find a black-throated blue warbler. We didn’t give up, though, and proceeded to the Cherokee National Forest on Unaka Mountain. We made one very productive stop, finding a singing veery, a scarlet tanager and a dark-eyed junco. We also found more warblers, including black-and-white warbler, worm-eating warbler and black-throated green warbler. I’m happy to report we also found a male black-throated blue warbler. So, the productive morning resulted in my meeting with a grouse with a lot of personality and Brayden getting a new species for his life list of birds. I don’t have any theory to explain Rufous and his acceptance of his human neighbors. I do believe birds, like humans, are individuals. Some of them have quirks that set them apart from others. Although he acts tame, Rufous is still a wild bird. Most ruffed grouse are extremely wary birds that go out of their way to avoid humans. Meeting a grouse that took humans in stride was a fascinating experience. Photo Courtesy of Jean Potter This photo shows the ruff of feathers that gives this grouse its common name. The ruffed grouse is named for the male’s neck ruff. These feathers around the neck can be erected in mating displays, creating an impressive “collar.” The ruffed grouse has served since 1931 as the state bird of Pennsylvania. Many years ago, a ruffed grouse boldly walked into my front yard and then ventured onto the front porch. Only my timely intervention rescued the visiting grouse from a cat that belonged to my parents. The unusual behavior of Rufous has persisted for two years. That, in my book, makes him a very unique grouse. I’ll always remember the day that I made his acquaintance. Photo by Bryan Stevens Rufous proved to be a grouse with a unique personality. This entry was posted in Birding, Birds, Ruffed Grouse, Tennessee, Uncategorized and tagged Birding, birds, Brayden Paulk, Bristol Herald Courier, Bryan Stevens, Carter County Compass, Elizabethton Star, Erwin Record, Feathered Friends, Flag Pond, Leon Rhodes, McDowell News, Northeast Tennessee, Our Fine Feathered Friends, Ruffed Grouse, Tennessee, The Erwin Record, Unicoi County on July 31, 2016 by Bryan Stevens. While driving to work on Nov. 5, I was surprised with a wonderful observation of a Ruffed Grouse, which flew across Simerly Creek Road. I got a great look at the grouse as it coasted over a field, crossed the creek and landed in the woods. It’s my first grouse sighting near home in probably more than a year. 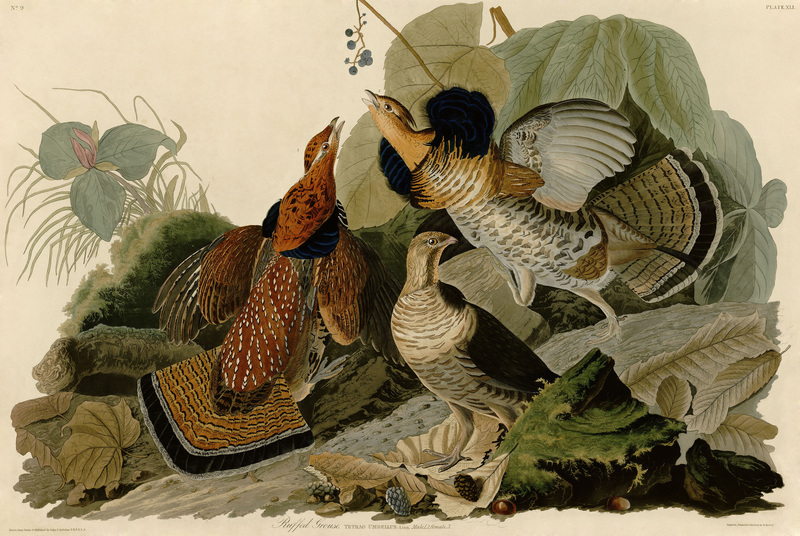 Early naturalist John James Audubon painted this scene dominated by a group of Ruffed Grouse. Males do not vocalize during mating displays, which sets them apart from other species of grouse. Instead, they beat their wings at high speeds to create a thumping sound known as “drumming.” The low-frequency sound carries a good distance even in thick woodlands. Ruffed Grouse thrive in second-growth woodlands. The Ruffed Grouse has been officially recognized as the state bird of Pennsylvania. Legislation enacting the recognition was passed by the General Assembly on June 22, 1931. In the recognition, the Ruffed Grouse is described as a plump bird with mottled reddish-brown feathers. This protective coloring makes it possible for the grouse to conceal itself in the wilds. As a game bird, the Ruffed Grouse has been studied more extensively than some other birds. This bird is not known for longevity. Few survive to three years of age, according to research conducted by the late Gordon Gullion, head of the Forest Wildlife Project at the University of Minnesota’s Cloquet Forestry Center. Guillion showed in his research that of 1,000 eggs laid in spring, only about 250 Ruffed Grouse will survive to their first autumn, 120 to their first spring, about 50 to a second spring and less than 20 will still be alive the third spring. These statistics emphasize the many enemies and other perils faced by this game bird. Yet, despite dismal numbers, it’s enough to continue the survival of the species. According to the website for the National Ruffed Grouse Society, Ruffed Grouse typically have a short life span. A brood consisting of 10 to 12 young are hatched in the spring, but by mid-August about half of them have perished. The cold months of late fall and winter will claim more of them. 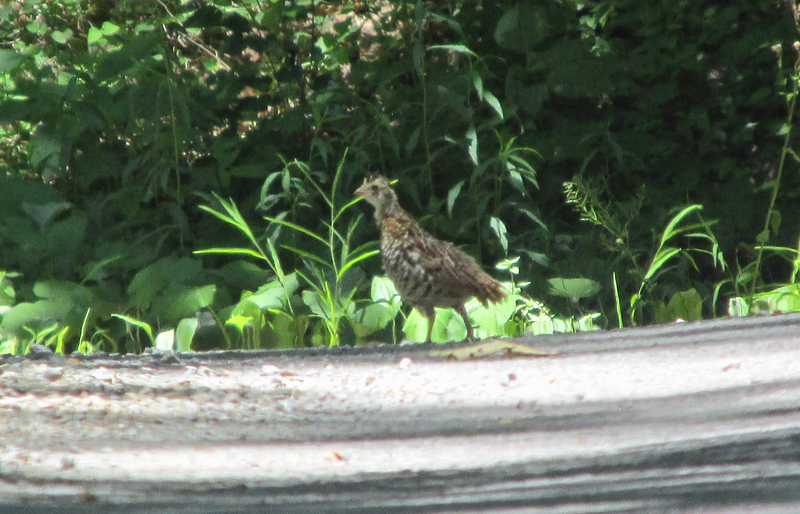 This Ruffed Grouse has inflated its namesake ruff of feathers. Studies have also revealed that Ruffed Grouse populations undergo a cycle of peaks and crashes. This population cycle of peaks and valleys repeats about every 10 years. What this means is that Ruffed Grouse numbers decline to a low point every decade, but there is also a corresponding peak when the local population of Ruffed Grouse surges. 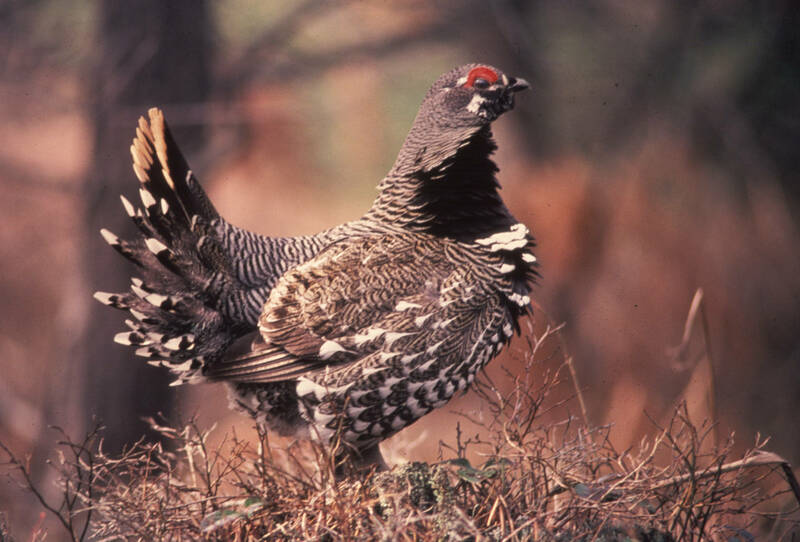 Other related grouse in North America include the Greater Prairie Chicken, also known as the Pinnated Grouse, as well as the Lesser Prairie Chicken, Spruce Grouse and Sharp-tailed Grouse. 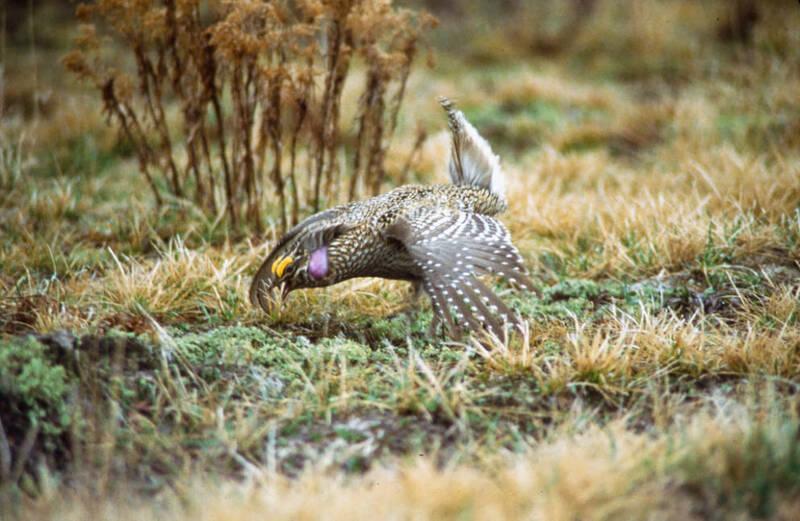 A Sharp-tailed Grouse, a relative of the Ruffed Grouse, prefers prairies rather than woodlands for its habitat. Despite some superficial similarities, grouse are not closely related to quails and turkeys. 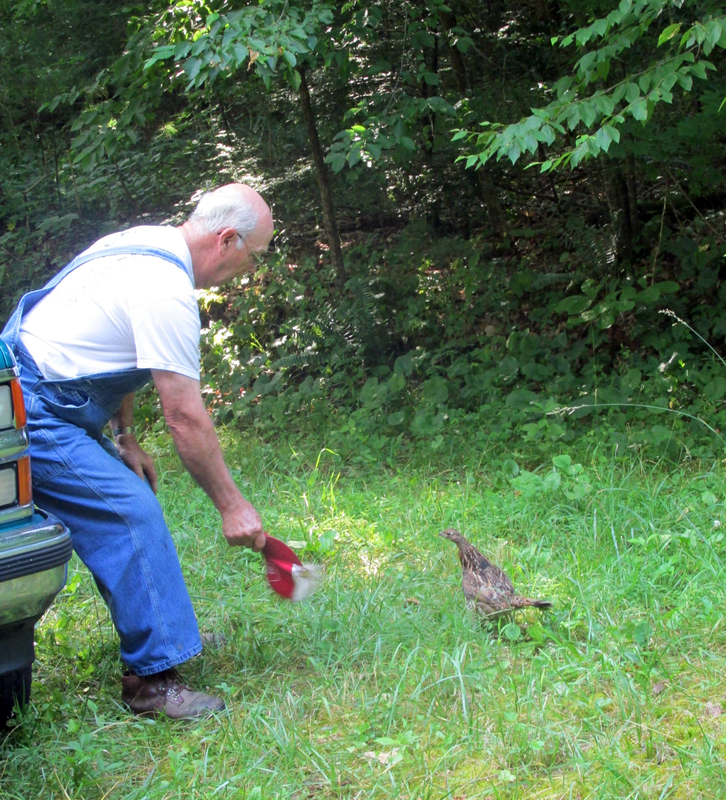 They are important as a game bird, but careful management is necessary. 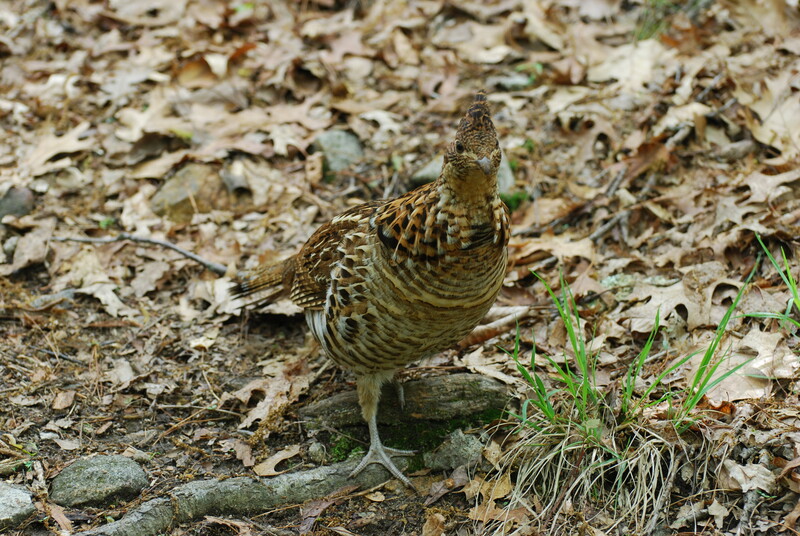 Particularly during the nesting season, individual Ruffed Grouse may lose their fear of humans. Many years ago, a Ruffed Grouse boldly walked into my front yard and then ventured onto the front porch. Only my timely intervention rescued the visiting grouse from a cat that belonged to my parents. 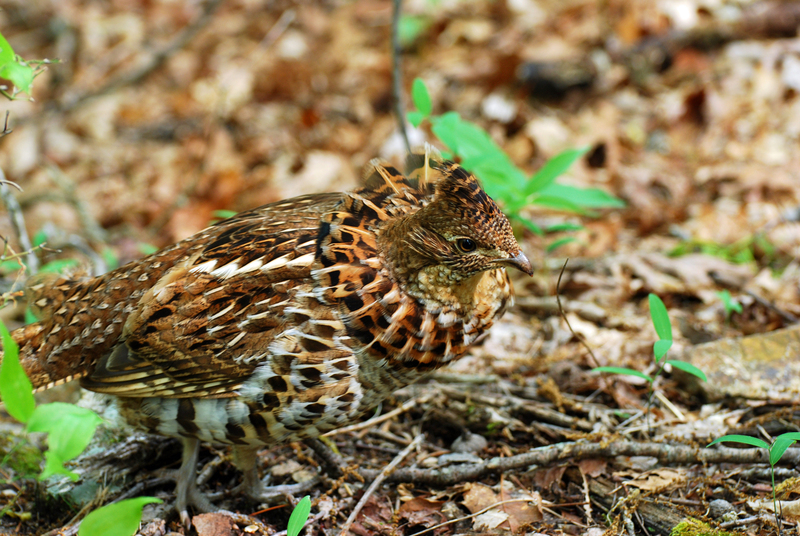 Holston Mountain in Carter County has long been one of the more reliable locations for finding Ruffed Grouse, especially during the nesting season. The Spruce Grouse is a distinctive looking relative of the Ruffed Grouse. This entry was posted in Birding, Birds and tagged Bonasa umbellus, Bristol Herald Courier, Carter County Compass, Elizabethton Star, Erwin Record, McDowell News, Ruffed Grouse, Winter birds on November 16, 2014 by Bryan Stevens.